With less than two weeks until the start of the official NFL season Will Smith's latest movie is making the gutsy move of going up against it. It seems a strange thing to state given Smith is typically a media-friendly star, but with his latest role as Dr. Bennet Omalu, a Nigerian-born neuropathologist who discovered Chronic traumatic encephalopathy (CTE) or “post-concussion syndrome” and unwittingly took on the NFL who used their power to discredit him, it seems things could get a little messy. Head trauma football players sustain has been something of a hot button issue for a while now and while the National Football League is a multi-billion dollar industry that would hate nothing more than it's cash flow to be hindered there is serious issue to be taken with the real price this money is being made at. As for the trailer itself, it will no doubt be difficult for some to look past that aforementioned persona that Smith carries so well to see his actual performance as Omalu, but the trailer makes it seem as if Smith might be putting his hat in the ring for a Best Actor nomination. Personally, I couldn't be happier Smith was able to squeeze this film in between the somewhat lukewarm reception Focus received earlier this year and the almost guaranteed hit that is Suicide Squad next year. This is exactly what his struggling career needed at the moment and if the final product is as engaging and complex as the true story it's based on we could potentially have something great here. 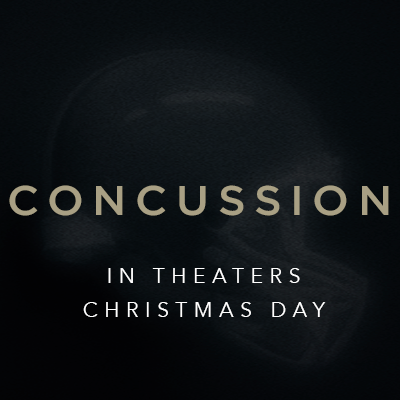 Concussion also stars Alec Baldwin, Luke Wilson, Gugu Mbatha-Raw, Arliss Howard, Paul Reiser, David Morse, Albert Brooks and opens on Christmas Day. Synopsis: Will Smith stars in Concussion, a dramatic thriller based on the incredible true David vs. Goliath story of American immigrant Dr. Bennet Omalu, the brilliant forensic neuropathologist who made the first discovery of CTE, a football-related brain trauma, in a pro player and fought for the truth to be known. Omalu’s emotional quest puts him at dangerous odds with one of the most powerful – and beloved – institutions in the world.